It’s another Ask DST with Diamond Select Toys president DSTChuck! This week he’s talking about everything under the sun, from Batman 1966 to Batman Animated, from Gotham to Godzilla, and from TMNT to PVZ! Read on to see if your question was answered, then submit your question in the drop-down form above, or send us an e-mail! Hi, I am really enjoying collecting the Batman Animated Series busts and was wondering if you plan on adding Justice League members like Wonder Woman and Aquaman to that line? Also, are there any plans to do busts of the Marvel characters? DSTChuck: Greg, yes, we hope to cover several characters from the Justice League, and they include both Aquaman and Wonder Woman. Aquaman, Hawkgirl and the Martian Manhunter have already been shown at a few conventions. Right now, we are not looking to jump back into the Marvel bust realm, but we’re having lots of fun with the Gallery PVC figures and the Premier Collection statues so you never know. Greetings! With Uncle Deadly being the break-out character from the Muppets’ new series, is there a new Select figure of him in your plans? And would you make this hypothetical figure in his Muppet Show raggedy suit or his new series fashionable threads? DSTChuck: We have planned the first four series of Select figures, and we’re not ready to announce the fourth series yet, but should be showing three soon. We have also noticed how cool he is in the new show. I don’t think if we would have decided his look yet, but I think the new threads would be cool. Hello. Are there any plans to release a King Ghidorah figure Bank in the future? There is already a bust bank out there, why not just sculpt the rest of his body? A lot of fans would love to own it. Thank you. DSTChuck: Right now, we have no plans for any other monsters, we might look to make some more Godzilla banks at some point, but we’ll have to see. Hello. Are you going to be releasing anything for Garden Warfare 2 since you made a bunch of figures for the first game? Thanks. DSTChuck: Yes, Ben, we’re working on figures and Minimates right now! The first Minimates box set is up for pre-order already. We also have some new GW1 figure at Toys “R” Us right now. With a Dragon Age Morrigan figure on the horizon, could we see others made? Or is she a one and done? DSTChuck: Shane, I do not think we have any plans for any more Dragon Age products at this time. Any chance could you look at expanding the Muppet line by adding Muppet sculptures that have been scanned from actual Muppet Photo Puppets and turned into 3D figures? DSTChuck: Right now, I don’t know if we’re going to branch off into sculptures, like bust and statues. I have a question about the Batman: The Animated Series Premiere Collectors line, the 12″ statues sculpted by Clayburn Moore. So far you have a “Mad Love Harley” and an “Almost Got ‘Em Ivy”. I it a female only line? If not can you give us an idea what characters will follow Ivy, and will any of them be male characters such as Mr. Freeze, Two-Face, or Scarecrow? DSTChuck: Right now, it’s focused on the females but we for sure have not ruled out expanding the line. The Gallery PVC figure line has already expanded to include Batman, Joker and Superman! DSTChuck: That would certainly be very nice! Hi, I love the Godzilla Banks but at the New York Toy Fair there wasn’t a display and I can’t find info on any upcoming banks. Are you going to do more Maybe a full King Ghidorah? Also Enterprise C and the Reliant when will we see these 2 major starships? DSTChuck: For this moment, the Godzilla bank line is on hold, but that may just be temporary. We have already shown digital sculpt pictures of the Reliant at Toy Fair. 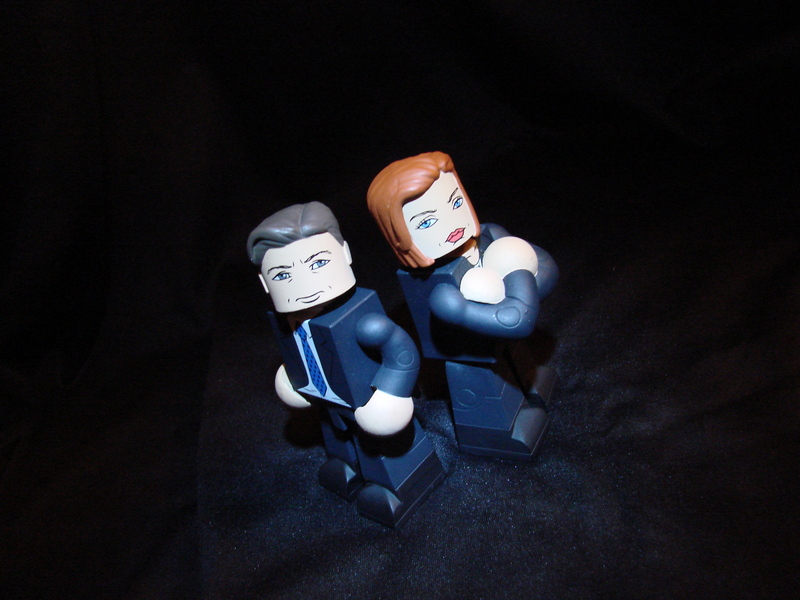 I, along with many other people, would dearly LOVE to see a set of PERRY MASON figures!!!! PERRY, DELLA, PAUL, HAMILTON, TRAGG, the courtroom & judge, Perrys office, Perrys car, it would be AWESOME!!!!!! And since ROBERT DOWNEY JR. is soon doing a PERRY MASON movie, that will spark alot more interest in the original show!!! PLEASE consider this!!!! DSTChuck: Sorry right now, no plans for a Perry Mason line of products. I was curious as to when the “Mallrats” figures are expecting to hit shelves? DSTChuck: The first series should be in stores this year. Hey gang, loved seeing all of the products at Toy Fair, curtacy of Pixel Dan, but I have a few questions. 1. Any chance of you releasing a Knight Rider – Knight Industries Three Thousand electronic vehicle? 2. Any chance of getting a GhostBusters electronic vehicle? Finally a sort of request. I’d love to see a Teenage Mutant Ninja Turtles party wagon with electronics based on the original cartoon, and in a 1:12th scale. Thanks for the awesome products you have produced thus far. DSTChuck: Right now no plans for new Knight Rider products, sorry, but a Ghostbusters Ecto-1 is in the works! We are not allowed to make vehicles for TMNT at this time – Playmates has that pretty well covered. Dear Chuck!Are Egghead and Batgirl to be the last classic Batman busts or can we expect KingTut, Bookworm, Shame and The Mad Hatter ?? DSTChuck: Hmmm… I guess you will have to wait and see, but yes, there will be more after Egghead and Batgirl. DSTChuck: Not only will there be a third series, which we have shown – Bruce, Barbara and Zsasz – but I can announce here that we’ve started sculpting on Series 4! Hi Chuck Any chance of a short update on new bust banks you may have planned in the near future. Possible new star wars ones; maybe new storm trooper as seen in force awakens and also ‘original’ storm trooper which is due to be used again in Rogue Squadron. I probably will get the Alien cookie Jar, almost got the Alien and Predator banks but I would of preferred if their claws/arms were also featured. Looking forward to getting the Penguin bank, I have Robin and the Joker already, hopefully you will be doing a Riddler one soon. Almost got Batman but the slightly different colored part of the arms where the arm is able to move put me off, I’m probably a bit too fussy like that. DSTChuck: We are not making any more Star Wars banks at this time. We do our best to make the highest quality banks possible, but there are some limitations. If these were resin at this size, I think they would retail for close to 100.00. Hi there! I have this question: I was thinking if there is any chances to make Action Figures inspired in the movie Small Soldiers. That movie shows exactly the perfect combination on design, sets, accessories, even the packaging in the movie remind me your kind of designs. I think Diamond Select is the most accurate Company to give us this AMAZING Franchise! Please!!! Make it for REAL! DSTChuck: Cool movie, but sorry no plans at this time to make products from that film. Got a question for DSTChuck? Submit it up top or e-mail him! Next Up: Ask DST #312: Marvel! Ask DST #303: All Hands on Deck! Ask DST #238: Miscellaneous Musings!